I’ve had the awesome opportunity to sit under the teaching of some fabulous speakers. Unfortunately, I’ve also sat through some somewhat disappointing speaking sessions. 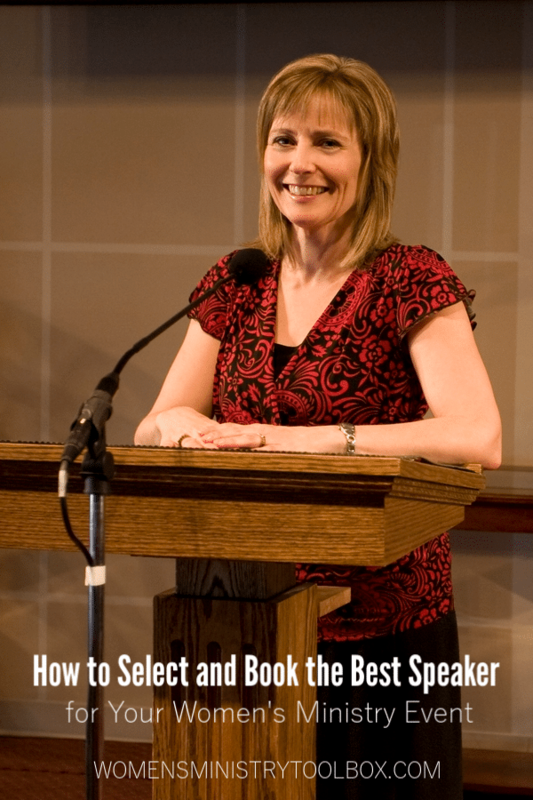 As you may have experienced, a speaker has the potential to make or break your event. It’s critical that we do all that we can to prayerfully and strategically select the best speaker we can. For the last month, I’ve been working to create a 5-day video series with worksheets that will walk you through every step you need to take as you select and book your speaker. You won’t need to waste hours scrolling and clicking through hundreds of speaker profiles. I’m going to help you narrow your list and then narrow it again, eliminating hours of wasted time. You’ll be armed with a great list of interview questions that will quickly reveal if the speaker is, or isn’t, a good fit for your women and your church for your next event. The best part is that it’s absolutely free! It’s delivered via email to you – one email each day for five days. At the end of those five days, you’re going to feel so much more prepared and equipped to select your next speaker. You’ll be able to move forward with confidence knowing that you’ve prayerfully and intentionally sought the best fit for your ministry. You’ll find the questions you ask now will smooth your event preparations later. Click this link to sign up for the free 5-day email course How to Select and Book the Best Speaker for Your Next Event. Go immediately to your inbox. You’ll receive a confirmation email that requires action! Click to confirm you want to be added to the list and then the first email will be sent your way. I pray this mini-course will be a blessing and a help to you as you seek to select and book the best speaker for your women’s ministry event!